1. Brush chicken breast halves with olive oil; sprinkle with ground cumin, salt, and pepper. 2. Grill on a covered grill directly over medium heat for 12 to 15 minutes, until done (76 degrees C), turning once. 3. Meanwhile, for Lemon-Cucumber Relish, in a medium bowl combine cucumber, tomato, onion, lemon peel, lemon juice, and garlic; stir to combine. In a small bowl combine yogurt, honey, and milk; stir to combine. 4. 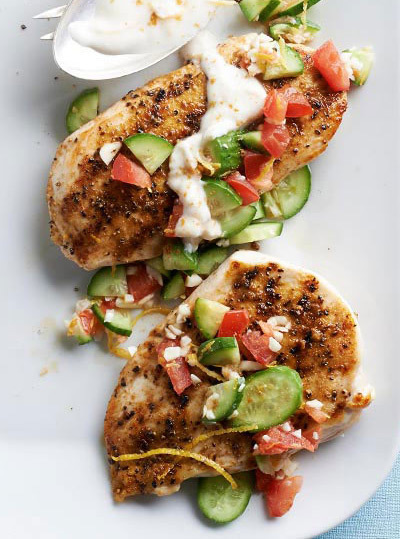 To serve, top chicken with Lemon-Cucumber Relish. Drizzle with yogurt sauce.